Writing Prompts to Stimulate the Imagination! Who knew that writing could be so cool? 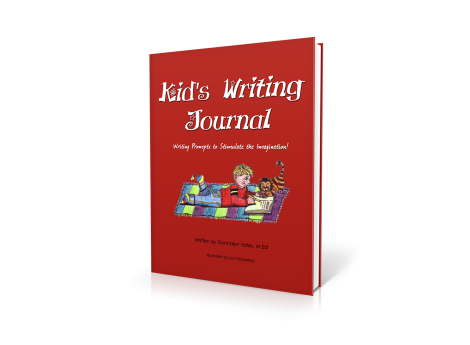 Kid’s Writing Journal has 365 creative, short journal-writing ideas, with inspiring quotations by famous people, thought-provoking sayings and lines from books. Get ideas flowing and writing going! When you grow up, what kind of person would you like to be and where would you like to go? If you don’t know, make up something! This easy-to-use writing journal not only gives children a writing experience, but teaches the powerful principles of honesty, trust, generosity, love and other values. When kids write and express their thoughts, they discover their own uniqueness. In January, the theme is the New Year, and you will learn to set goals, make plans, and discover ways to improve yourself. Read the quote below, and think about your plans. Since this is the beginning of a new year, what are you going to do differently? Make a list of everything you like about yourself. Make another list of things you’d like to change. Write something you are going to do today about your goal. Under each prompt there are ample lines for students to write a response. Each month has a different character building trait. This is a journal to help children think deeply and express their thoughts and feelings, even at a young age. It becomes a wonderful keepsake.